AN 8-BOOK SET OF YOUNG ADULT HIGH FANTASY ROMANCES FROM A NEW YORK TIMES BESTSELLING AUTHOR! 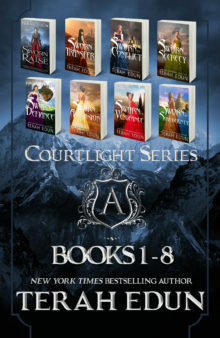 Get the entire volume one of the Courtlight series for nearly half off list price! Adventure and romance, magic and secrecy, are woven into a fantasy world that is a phenomenally unique and captivating tale. In this breathtaking launch of the successful high fantasy series, readers will be kept on the edge of their seat. She wants Ciardis to become a companion: she’ll be required to wear expensive dresses, learn to conduct suitable magic, educate herself oncourt proclivities, and – in the end – chain herself to the highest bidder. A Patron for life.